Has the homicide rate in Mexico begun to fall? The National Statistics Institute (INEGI) recently published state-by-state intentional homicide (murder) statistics for 2012. The values calculated by INEGI for rates/100,000 population rely on CONAPO’s estimates for the population each year. The INEGI report includes homicide trends from 1990 to 2012. From 1992 to about 2007, homicide rates in Mexico declined (see graphic) to 8/100,000 in 2007. However, during former President Felipe Calderón’s “War on Drugs”, the homicide rate almost tripled. In 2010 and 2011, the national rate averaged 23/100,0000. These national averages mask a huge difference between males and females. 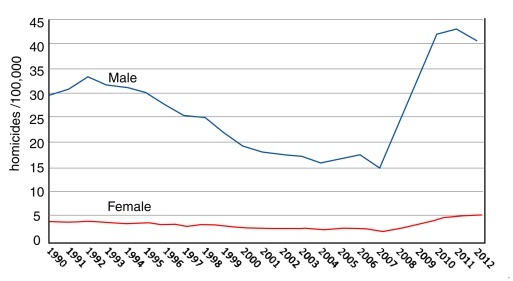 For example, the 2011 rate for males was 43/100,000, about eight times higher than the 5/100,000 recorded for females. As the graphic shows, there is some slight evidence that the homicide rate for males is beginning to fall again. How do the rates of intentional homicide differ across Mexico?